Figaro Engineering Inc. is pleased to announce its latest offering--a compact galvanic cell type oxygen sensor, SK-25, with popular pin configurations for industrial gas sensor applications. The most notable features of SK-25F are no influence from CO2, good linearity up to 30% oxygen, and excellent chemical durability. These features make the sensor ideal for oxygen monitoring in various applications such as the biochemical field, food industry, and safety applications. In comparison to our conventional KE-series oxygen sensors, the new oxygen sensor has no position dependency by virtue of its unique internal structure, enabling usage in portable applications. The Partial Pressure Control type shows an excellent linear relationship between oxygen concentration and sensor output. One advantage of using this sensor is the ability of users to perform simple and accurate two-point calibration (e.g. 0% oxygen and oxygen at certain concentration). A common perception of the Partial Pressure Control type sensor is that it has larger temperature dependency and slower response speed than the Mass Control type. However, by embedding a temperature compensation circuit inside the sensor, the sensor output of SK-25F has a smaller temperature dependency than the Mass Flow Control type. In addition, due to its unique gas diffusion electrode technology, SK-25F has quicker response speed than the Mass Flow Control type. Since a voltage conversion circuit is included in the sensor, warm-up time is not required after mounting on a PCB. Customers can measure oxygen concentration quickly after mounting on PCB. To minimize consumption of the sensor life during storage, the gas diffusion holes are covered by blue tape when the sensor is shipped. Measurement can be performed quickly after removal of the blue tape. Question: Can the sensor be used for higher than 30% O2? Answer: Unfortunately no. Please do not expose O2 concentration higher than 30%. Otherwise, the sensor may be damaged irreversibly. 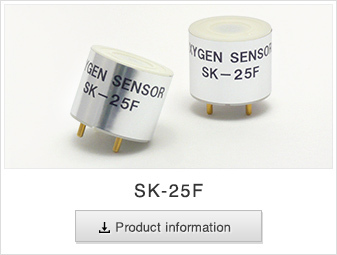 For higher concentration detection, KE series oxygen sensors are recommended. 1) When calibrated at both 0% and 30% of O2, accuracy in the range from 0-30% O2 shall be within ±1% full scale. 2) Sensors should be used under conditions where the air exchange is greater than 200~300ml/minute in order to obtain the response speed as specified in Table 1. 3) Life expectancy at 20˚C in normal air is defined as the period until sensor output drops to 60% of original value.